Dr Rania Edris, a School of Medicine PhD student based at IMAR at the TORT Centre, has won a Postgraduate Student Award at this year’s Venture 2017 Competition Final which took place on Friday 24th February at the Dalhousie Building. The Centre for Entrepreneurship runs this new business idea competition for University of Dundee Students, Staff and Recent Alumni (graduated during last two years) with six prize fund categories. 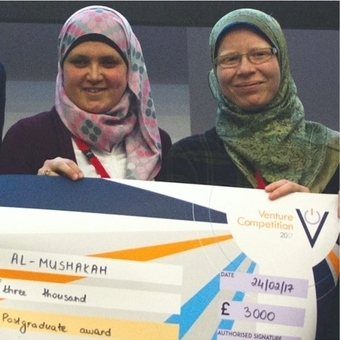 Rania, from Egypt, and her business partner, Dr Rana Abu-Mounes (PhD in Islamic Study, History of Christian-Muslim Relations at the University of Aberdeen) won the postgraduate student award prize fund of £3000, sponsored by Enterprise Campus, for their business idea Al-Mushkah. Al-Mushka is a social enterprise that will provide consultation and training services to Muslim women. Public, private and third sectors will be able to use the services to enhance the integration, cultural assimilation and economic development of religious and/or ethnic minorities in Scotland.